that the Species of Homosapien would be burned off the face of the planet. I figured that would happen in maybe 30 years. People wrote in and said I was exaggerating. They said I was doing my cause “no good” by stating things so radically. I believe the same thing now, but I think it is coming more rapidly and could have a significant impact by 2020. Yes! Everything is speeding up. The Fifth Assessment Report (AR5) provides a clear and most up to date view of the current state of scientific knowledge relevant to climate change. It comprises of three Working Group (WG) reports and a Synthesis Report (SYR) which integrates and synthesize material in the WG reports for policymakers. The SYR will be finalized 31st of October 2015. Further information about the outline and content and how the AR5 has been prepared can be found in the AR5 reference document and SYR Scoping document, AR5 page and on the websites of the WGs. 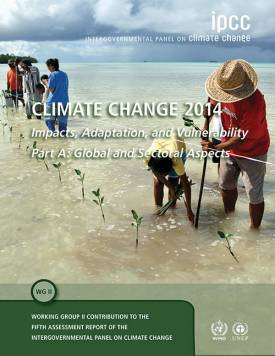 The Working Group II contribution considers the vulnerability and exposure of human and natural systems, the observed impacts and future risks of climate change, and the potential for and limits to adaptation. The chapters of the report assess risks and opportunities for societies, economies, and ecosystems around the world. Go there and get really scared. More next week.